Free Robots and transformers coloring pages to print for kids. Download, print and color! Robots and transformers, favorite characters of movies and animated cartoons, are presented as coloring pages on our website. 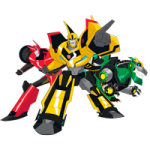 Choose any pictures with robots and transformers coloring pages. We did our best to collect the most interesting items for you to color.